Thank your employees and clients with some fun! Whether you’re celebrating a small group or the whole office, we‘ll help you show your appreciation.Select one of our breakfast, lunch, or dinner packages and host a meeting or conference unlike any other. With private rooms and AV equipment, Dave & Buster’s the perfect combination of business and fun. Plus, we've got plenty of space for breakout meetings or smaller group activities. All private spaces will range between $100-$275 depending on the size of your group. 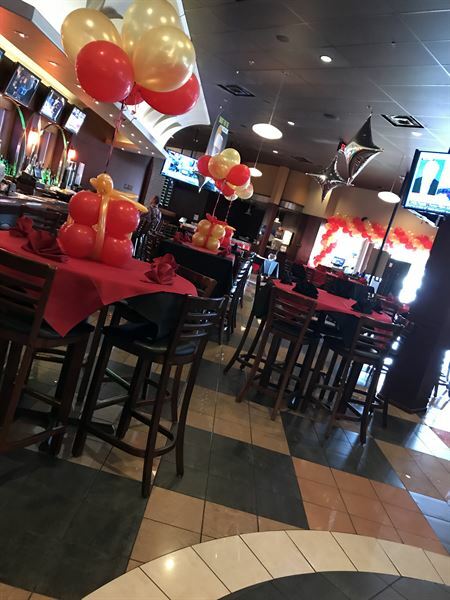 This will give you a private room for 3 hours with full audio visual capabilities, a manager, and wait staff dedicated to your party. We have over 33,000 square feet of fun waiting for you. Dave & Buster’s is available to accommodate groups of 150 – 1215 for Buy-Out. With the exclusive use of Dave & Buster’s for your group, there is sure to be something for everyone. Whether your event is a holiday party, a summer picnic, or a day to show your employees how much you appreciate them, we can customize your event for success.